The talented Viviane Schwarz brings a feline spin to counting in this very funny concept book. At first Tiny Cat has none. Then, what’s that? One! Two! Three! And . . . four! Oops, bonk, now there’s more! Soon Tiny Cat has as many red balls as you can get. Then some extra. Is that too many? Will Tiny Cat ever have just enough? Viviane Schwarz is the author-illustrator of the acclaimed picture books There Are Cats in This Book and There Are No Cats in This Book, both of which were short-listed for the Kate Greenaway Medal, as well as Is There a Dog in This Book? and How to Find Gold. She lives in London. 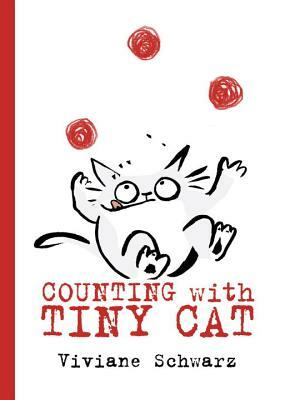 'Counting With Tiny Cat,' written and illustrated by Viviane Schwarz (‘Is There a Dog in This Book?’), is partly a study in counting, and even more the record of a cat’s futile pursuit of personal fulfillment and identity through the acquisition of little red balls of yarn. Schwarz’s crackling visual humor comes through in Tiny Cat’s exuberant reactions and movements, and for readers not quite ready to see Tiny Cat go, the endpapers offer additional misadventures.